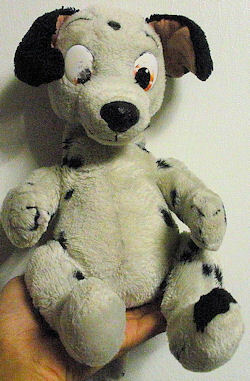 Looking for a (I think is from) 101 Dalmatian beanbag puppy from when 101 Dalmatians first came out using real actors/ actresses. I had got him from Blockbuster videos, for $5, I think back in 1996 and had him ever since. He’s about 9 inches in height, about 6 inches for the waist 🙂 His torso is a beanbag, while his arms, legs and head are all cotton stuffed. In the pictures, besides the noticeable scratched eyes, he’s missing a brilliant red vinyl/ leather collar. Notice the black dot on his forehead. I never knew why he had it. I had gotten him from Blockbuster videos for about $5 I believe back in 1996 when the first 101 Dalmatians movie starring Glenn Close and other real actors and Dalmatians was a box office hit. When I was little, my mom had bought me and my sister a pair of Dalmatian plush. The one I got became my best friend, never a day did I slept without him next to me or I traveled without him. And I still have him! When I had gotten older, my oldest sister bought me a new Dalmatian, roughly at the time 101 Dalmatian was making a hit in theaters in 1996, as a replacement for the first one because he now looks raggedy. However, being very fond of my first Dalmatian plush, I didn’t really grow into my second Dalmatian. Then later in 1996 when 101 Dalmatian was hitting Blockbuster video rental shelves, I had gone to Blockbusters with my mom, who wanted to rent a movie. I came across a table filled with various plush and bean bag animals. My mom wanted to leave, but allowed me to pick one from the table; I didn’t know which to get, all were tempting. It came to a point where if I didn’t pick anything, I would’ve left with nothing. I then randomly picked up a beanbag Dalmatian without thinking. I just wanted something, a new toy, as I was still a kid. Little did I, my parents or my sisters know, I had picked up a new best friend. To this day, he is still my best friend who is always right beside me when I’m sleeping or wherever I am in the house. As I am 22 now, taking him places is odd. But once in a blue moon, he travels with me. If I ever lose him, I would be losing the longest friend I’ve ever known, a major puzzle piece of my life. Just checked out the eBay auction. It could be him! I purchased it anyways. However, I have doubts it’s not the exact same one. I don’t remember him to look like that new… Then again, mine has “aged”. BUT VERY VERY MUCH THANKS! im looking for that same dalmation for my niece. i had one when i was little and she loves it i want to find her one. any help? ?